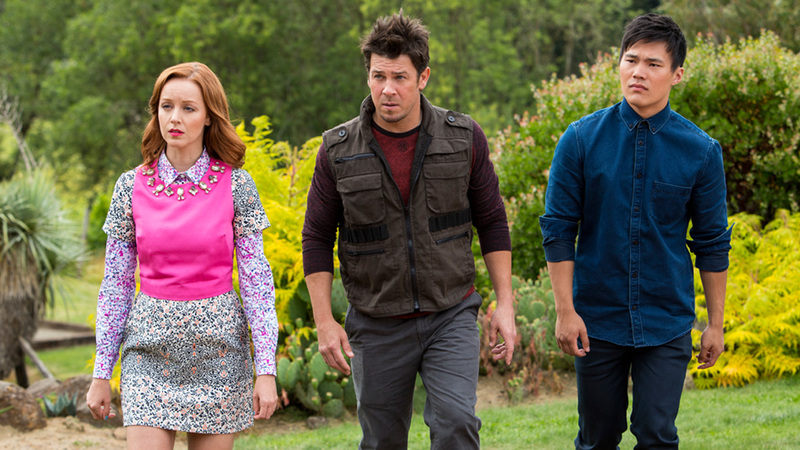 As we wind down Season Three of The Librarians (with Season Four already locked in), I find that not only has it gone from strength to strength. And the Eternal Question has a pretty sharp story, a strong mix of comedy, drama, and action, and should be the showcase to Lindy Booth as an actress. The Librarians investigate what appears to be a case of spontaneous combustion. As they look into the case, they find that both victims, a husband and wife, went to Vida de la Luz (Life of the Light) a holistic retreat to treat the husband's terminal cancer. It appeared that the retreat managed to heal the man, but why then did he just burst into flames a week after leaving, and why did his healthy wife also explode? The retreat is run by Sophia (Norma Maldonado), a Spaniard, and her two children, Tomas (Rafael Cebrian) and Estrella (Clara Lago). They appear to be good people, but soon, thanks to the exam of the ashes by Jenkins (John Larroquette), it is established that the family is vampires. Both Jacob Stone (Christian Kane) and Ezekiel Jones (John Kim) want to rush in and do some vampire hunting, but Cassandra (Booth) is firmly against it. Cassandra's hesitancy has multiple motives. She sees that Sophia and Estrella have not acted on their vampire reactions, finding the retreat a safe haven. However, unbeknown to the others, the tumor she has in her brain has grown to such an extent it has to be operated on or she will die. Fearful she will lose her powers, she won't go through with it. Her behavior becomes extremely eccentric: she's more perky than usual, and even asks Jenkins out on a date! Speaking of dates, Flynn Carsen (Noah Wyle, who directed) under the guise of searching for Charlene, spirits Guardian Eve Baird (Rebecca Romijn) to a romantic retreat of his own (where they spend most of the episode). Jones and Stone discover what is going on: a rogue element within the Vida de la Luz is trying to find a secret formula that will allow vampires to walk freely outside the retreat (the only place where they can go into the sunlight without it affecting them), and Cassandra figures out why the retreat has been a haven (the vampire-friendly minerals are in the water, not the soil or the fruits of the soil). We also discover who is behind this plot to go all True Blood. Jenkins, having found Cassandra's secret, comes to the rescue when the vampires appear to trap the three Librarians and rush Cassandra to the hospital. It's a choice between her gift and her life, and in the end, she finds she need not lose one to keep the other. And the Eternal Question is Lindy Booth's finest hour in The Librarians. It is because she gets a chance to play a whole range of emotions and handles each of them well. There's the typical Cassandra, upbeat and perky (so much so that everyone else assumes she has had too much coffee). However, in the quieter moments, those where she faces her mortality, Booth is quiet, contemplative, even tragic. She balances the dark drama and the perky comedy, giving the viewer a complete character. In terms of acting, Lindy Booth really knocked one out of the park. She is complimented in her performance by Larroquette, who makes for a strong partner in their scenes together. The script gives them a great deal to work with, even giving us little hints that hearts do beat beneath their exteriors (note, for example, that the formal Jenkins calls Cassandra by her first name rather than his usual "Miss Cillian" when turning her down). It's a very nice interplay between Booth and Larroquette, one that shows they care about each other, but not in that way. Larroquette also has a great moment when Jenkins showcases his sword skills when rescuing Stone and Jones, as befits Sir Galahad. Stone and Jones' reactions are a comic delight: as both cry "Jenkins! ", in their vocal inflections Stone's reaction is one of excitement, Jones' more of puzzlement. Kane and Kim make for an amusing double-act, as if they are two kids relishing and fearful of having to face vampires (though, no worries...the swimming pool is blessed regularly with holy water according to Jenkins). Wyle and Romijn were sadly off to the side and they had little to do, but given that Wyle already had double duty as actor and director, and that the episode had to balance so much one should cut them a bit of slack. Guest stars Lago and Maldonado were good as the mother-and-daughter of the undead who didn't want to do any harm, and it's nice to see Hispanics on the screen (even if they are vampires). If there is something to pick at with And the Eternal Questions, it is the somewhat rushed manner of finding out what the conspiracy is (though again, in an one hour episode, one has to get through things quickly). It wasn't much of a mystery who was behind the machinations, and while that's no big issue, Cassandra's love life is curious to say the least. Up till now, there's never been any notion that she carried a flame for Jenkins. Even if there had been, the March-December romance looks wildly peculiar. Add to that Estrella's own lip-lock with Cassandra and one wonders what exactly is going on here. There's no indication that Cassandra is bisexual or gay, and while there's nothing wrong with having a gay or bisexual character it does all seem to come out of nowhere. Or perhaps not: Cassandra finds attraction with two beings who are immortal. Was it all a subconscious effort to reach out to live forever when her life is so perilously close to ending? She was tempted to become a vampire in order to stop from dying, and she reaches out to the immortal Galahad. Some food for thought. Minus the rushed discovery of the villain and the odd shipping going on, And the Eternal Question has a major plus with Booth's performance: the mix of fear and faux-cheeriness giving her an immense amount of material to dive into. Keeping the elements of action, comedy, and adventure that is its hallmark, And the Eternal Question is in turns hilarious and moving. It was a fast paced show! Just another reason to add more than 10 episodes per season! So much to cover in so little time! I still don't understand why more families aren't watching with their children! Should be the #1 show on tv! TNT needs to ante up and invest a little time into this show! The characters usually seems to play well off of each, with all the characters getting their time in the sun! How in GOD's name do we get the added episodes so it can develop even more; can you imagine the possibilities? Perhaps rather than up the number of episodes, perhaps one or two 'specials' to tie people over?